Night crawlers are a type of large, robust earthworm. 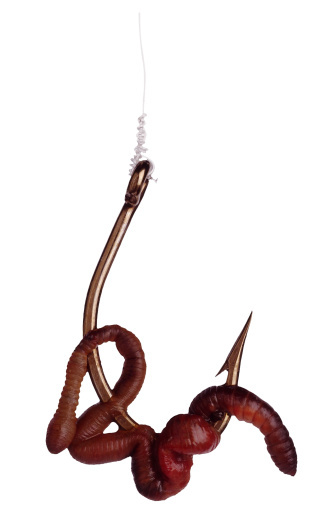 Easily identified by their dark-red heads and stout, elongated bodies, they are a popular choice for fishing bait. Night crawlers also can be used as a food source for pets, such as reptiles and birds. They also can be placed in the garden, where they aerate the soil, or in the compost heap, where they turn unwanted trash into rich organic matter. Thriving in moist, dark conditions, night crawlers are easy to raise at home as they take up little space and have very simple needs. 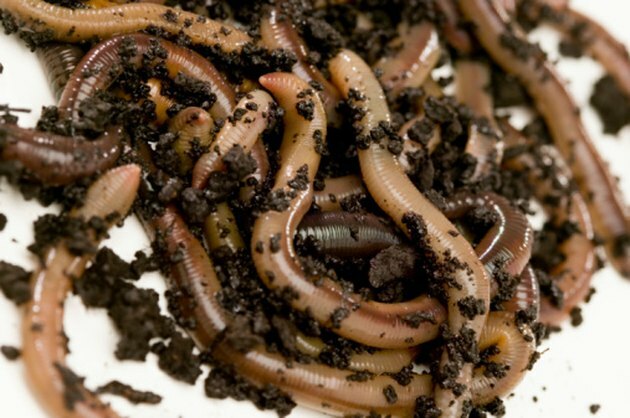 Earthworms aerate your garden soil. Select an opaque container for your night crawlers, since they prefer living in the dark. The container can be made from plastic, metal, wood or Styrofoam and should have a lid to help keep in moisture and protect the worms from the elements. Choose a container that will allow for adequate growth and development. At minimum, plan 1 square foot of storage area for every 1,000 night crawlers you expect to raise, according to Worms.com. If you are planning to store your night crawlers in the refrigerator, be sure the chosen container will fit neatly inside. Drill several small holes into the sides of the storage container. Place the holes near the top to allow for adequate air circulation. Don't make the holes too large, or they may provide the night crawlers with an escape route. Place a 1-inch layer of sand or gravel on the bottom of the container to ensure adequate drainage of the worm bedding. Cover the sand with a 2-inch layer of shredded newspaper to help the bedding retain moisture. Fill the remainder of the container with potting soil, peat moss or high-quality compost, creating a layer of bedding that is at least 6 inches deep. Pour water over the bedding 1 cup at a time. Mix the bedding well after each addition. Add water until the materials are evenly moist, but not wet. Add night crawlers to the container. Begin with approximately 1 lb. of worms. Place night crawlers on the surface of the bedding. Do not cover them with soil; they will burrow down on their own. Put the lid on the container. Move it to a cool, dry location out of direct sunlight, such as the basement or garage. Night crawlers can be stored in a refrigerator as long as the temperature isn't set below 60 degrees. Although night crawlers can live at lower temperatures, they won't reproduce, according to Trinity Ranch. Feed the night crawlers every two or three days by sprinkling vegetable scraps, ground oatmeal, coffee grounds, shredded leaves or grass clippings over the bedding material. Check the moisture level of the bedding material at least once a week. If the bedding has begun to dry out, add water 1 cup at a time until it is moist again. Gently toss the soil after the addition of each cup of water. This distributes the water evenly throughout the bedding material, aerates the soil and helps the worms breathe. Wait two to three weeks for the night crawlers to breed. As hermaphrodites, every worm has both male and female sexual organs, so as long as you have at least two worms, they will find each other and reproduce. According to Worm Man's Worm Farm, under ideal conditions each night crawler lays one or two eggs a week; each egg that hatches will produce four or more new night crawlers. Clean the storage container once every two months. Remove everything from the bin, plucking the worms from the bedding and putting them in a safe, temporary location. Wash the container with mild soap and rinse thoroughly. Replace the old bedding, add water and return the worms to their new, clean home.